But how will they enforce it? With the help and support of the United States Navy, that's how! 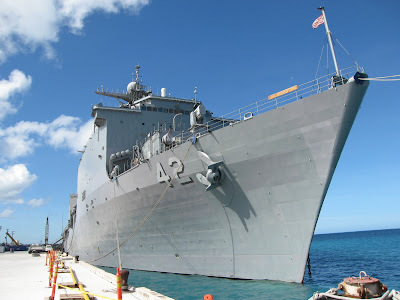 The Marianas Variety reports that the Marshall Islands and the United States have signed an amendment to a 2008 maritime surveillance and interdiction cooperation agreement known as the “shiprider” pact. The new agreement will allow Marshallese enforcement officers, many of whom attended an enforcement training sponsored by the Pew Charitable Trusts in September 2012, to travel onboard US Navy vessels patrolling Marshallese waters. Previously, Marshallese enforcement officers were allowed only on Coast Guard vessels. Expanding a successful partnership between the U.S. Coast Guard and Marshall Islands law enforcement officials, the U.S. Navy will join in protecting the vast ocean area of this western Pacific nation following the signing of a new agreement in Majuro Tuesday. U.S. Ambassador to the Marshall Islands Thomas Armbruster and Marshall Islands Foreign Minister Phillip Muller signed an amendment to a 2008 maritime surveillance and interdiction cooperation agreement known as the “shiprider” pact. Since 2008, the shiprider agreement has provided authority for Coast Guard vessels to assist the Marshall Islands with maritime law enforcement, primarily focusing on fisheries. Last year, Marshall Islands officials on board a Coast Guard vessel boarded a Japanese vessel and confiscated a large volume of shark fins that are illegal here. The boarding resulted in a $125,000 fine for the vessel. The new agreement now allows Marshall Islands law enforcement officers to be “shipriders” on Coast Guard, Navy and other U.S. Defense Department vessels. This is a game changer for marine enforcement in the Pacific and will have significant impacts on illegal fishing. It is impressive enough to have the US Coast Guard enforcing fishing regulations; it is quite another to have the US Navy involved. Imagine a Navy destroyer pulling alongside a suspected illegal fishing vessel! Congrats and thank you to the people and governments of the Marshall Islands and the United States for this exciting development. Hopefully this successful partnership will spread to the other shark sanctuary countries in the Pacific.